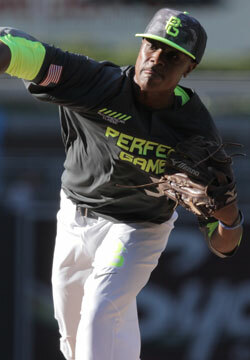 Lawson has been on the national radar for quite some time now and his performance at the Perfect Game National Showcase in mid-June showed why. He has an extra-long and lean frame with big projection remaining and big present stuff. His solid overall mechanics and smooth delivery allow him to command his fastball, which has been clocked as high as 93 mph, extremely well. Lawson also possesses a quality mid-70s curveball that has continually gives opposing hitters fits.